The Zenhaven mattress by Saatva has the perfect name that accurately describes this dreamy latex mattress. This 100% Talalay latex bed is the right amount of hug and response. It also gives your body plenty of support and the best comfort. This amazing mattress is also two-sided. With one side being a little softer and the other a little firmer. Which makes finding your ideal feel in this perfectly balanced mattress that much easier. This Zenhaven mattress review will tell you everything you need to know about this one of a kind mattress. 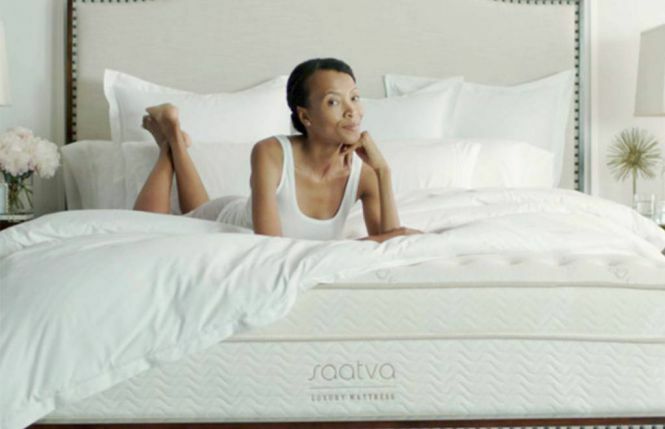 Latest Zenhaven Mattress Coupon – HERE! This is the best organic mattress on the market. This 10″ natural latex mattress uses the most premium Talalay latex foam from top to bottom. Talalay is a more consistent, airy and breathable latex. It makes for a very soft yet supportive feel like no other. This makes for a bed that provides the necessary spinal alignment as well as the right amount of responsiveness. Latex is a naturally aerated material that will provide a cooler sleeping surface. It’s also dense enough to make for minimal motion transfer and great for stomach sleepers. The natural spring is a perfect answer to relieving pressure throughout the entire body too. The quality of the latex and top-notch construction make this a durable, long-lasting mattress that will perform as intended for many, many years. The Zenhaven has an organic cotton cover with wool quilting for added plushness too. The benefits of these materials create a breathable and moisture wicking addition to an already cool bed. This ensures that you are getting a 100% natural mattress from cover to cover. This luxury latex mattress is at a great price point. Especially when you consider that you are basically getting two beds in one. It even comes with free delivery by a White Glove Delivery service. And with this very heavy, substantial mattress you will be happy for that. As well as a 20-year warranty, this proves just how durable latex is. And a 120-night sleep trial too. If you want a natural latex mattress with the best materials and premium feel the Zenhaven bed will check all your boxes. Below we have our in-depth Zenhaven mattress review. We will go through how it performs in comfort, motion transfer, sleeping cool & edge support. As well as the value, materials & construction, trial period and warranty. The Zenhaven mattress will be delivered free of charge by white glove delivery service. It will not just be dropped off by your front door like most bed in a box brands. It will be brought to your bedroom, set-up and all garbage is removed in a matter of minutes. Your new Zenhaven will be ready to sleep on instantly and no waiting for it to expand or air out. Having this mattress delivered is awesome for so many reasons. This bed is very heavy and kind of awkward to move, so having that taken care of is an added bonus. You can even request for your old mattress to be removed in the process too. Making the overall experience very easy and customer-centric. Since this mattress is not roll packed and it’s made in the USA you will not notice off gassing while it is unpacked. You may want to let it breathe for a bit before putting your protector and bedding on. But off gassing will not be an issue. This mattress is an all natural Talalay latex bed and will have some natural latex fumes. These are very minimal and more natural smelling, giving you a healthy and ready to sleep on bed. This mattress also comes with the option of purchasing a box spring and frame or the Lineal Adjustable Base as well. Otherwise, this mattress will need a foundation that provides a flat, even surface that will support the weight of the mattress as well as the sleepers. It also will need to be the right height for you as well as be aesthetically appealing. The Zenhaven mattress would work great on a box spring with or without a frame, an adjustable base, a platform bed or slatted bed. 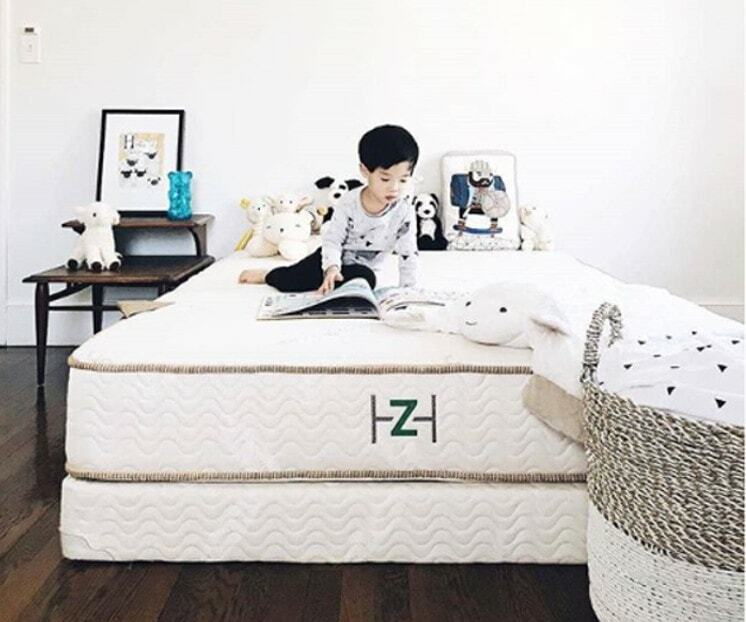 Buy the Lineal Adjustable Base & Zenhaven Mattress HERE! The Zenhaven mattress is a two-sided mattress, with each side having different comfort levels. One side is luxury plush while the other is a gentle firm. Giving you two slight variations in feel but with the same necessary support. The luxury plush is the most popular used side and provides a great combination of support and cushion. 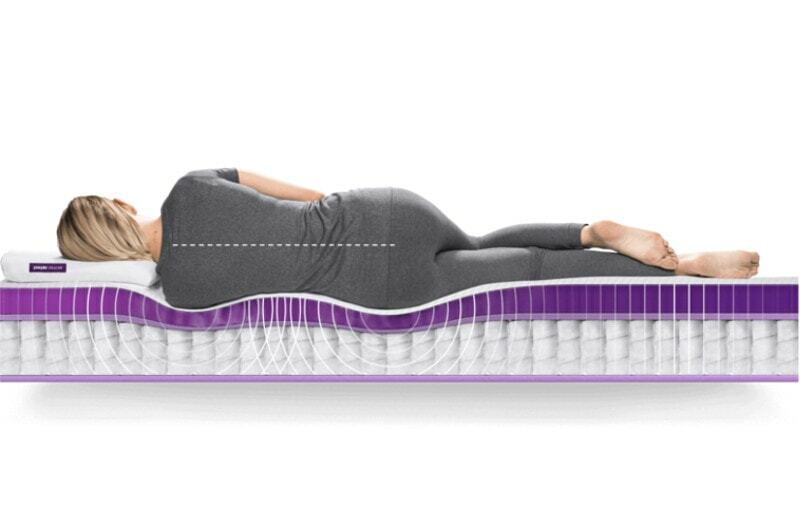 This side would work great for back and side sleepers and is going to be best for people who like a supportive feel but with still a little extra softness. The gentle firm side is going to appeal to people who like a firmer feeling and more than likely sleep on their stomachs and back. It will also be a great mattress for heavy people. Having these options on the same mattress really allows for you to find what will work best for you, and if it doesn’t all you have to do is flip it over. Regardless of which side you opt for the amazing feel and responsive pressure relief you get from the Talaly latex won’t disappoint. The feel of this latex is less dense and more consistent than the alternative, Dunlop latex. Giving you a more luxurious feel that cradles you just enough without ever feeling stuck. The natural buoyancy allows for easy moving while still contouring to your body. Making it a very premium bed that will have ideal comfort for years to come. We loved trying out the Zenhaven mattress and found it to be very comfortable. This is the only bed we have tried to date that has been 100% Talalay latex and you can definitely feel a difference in quality and density. This mattress is still ideally supportive but there is something about the latex used that is a little softer and contouring and just feels more consistent and pliable. The Zenhaven is a truly unique one of a kind mattress. Latex really allows for you to move easily and not feel stuck or too cocooned. The dual side option is made it easy to find the perfect firmness we preferred too. This mattress also didn’t get too warm and hardly had any heat retention. If you like the feel of latex in general but want an even more luxurious option, this mattress will really blow you away. 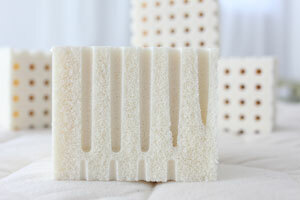 Talalay latex foam that is known for being more responsive. However, the dense core combine with the premium comfort layers and wool batting do not produce very much excess vibrations. Even with a naturally more responsive material with inherent spring, there will be very minimal motion transfer with the Zenhaven. Due to varying sleep schedules, getting up to take care of a young child and a dog that needs to go out we put the motion transfer of this mattress to the test. This mattress producedvery little vibrations, even with 100% latex. Partner disturbance was minimal even though we felt like it was very easy to move on and change positions. Making it great even for lighter sleepers and anyone who shares a mattress. Unless you are super sensitive to movement, this bed does a fine job for isolating motion. If you want a naturally cooler sleeping mattress than this bed is one of the best. Latex, regardless of being Talalay or Dunlop, is known for its great aerated build and naturally cooling ability. Latex is an open cell structure and allows air to flow through easily. This very breathable material allows for the mattress to stay cooler and comfortable while you sleep. 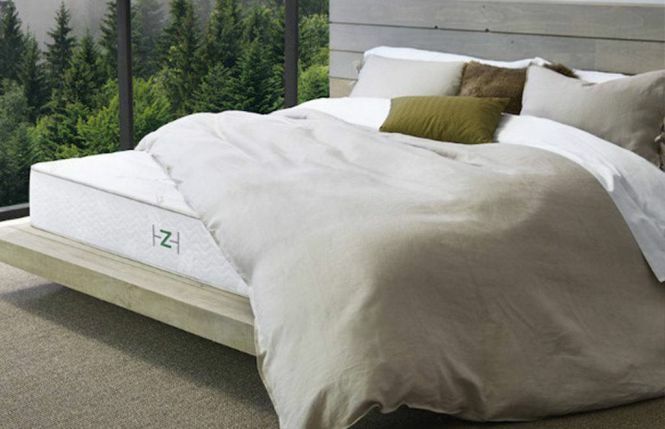 Being that the Zenhaven mattress is 100% natural latex makes for a great temperature neutral bed all night long. Also, the top layer of this bed uses wool batting. Wool is a natural moisture wicking material that is also temperature regulating. Allowing for yet another layer of pure and healthy materials to provide amazing natural benefits. Not to forget the organic and soft breathable cotton cover. Allowing the last element of this very natural mattress to work in harmony with the others to provide an ideal experience. Again, we really love the properties that this mattress has. Latex, as well as wool, are a few of our favorite materials used in mattresses for these natural benefits. This mattress kept a very comfortable temperature throughout the night and doesn’t allow for heat to build up. 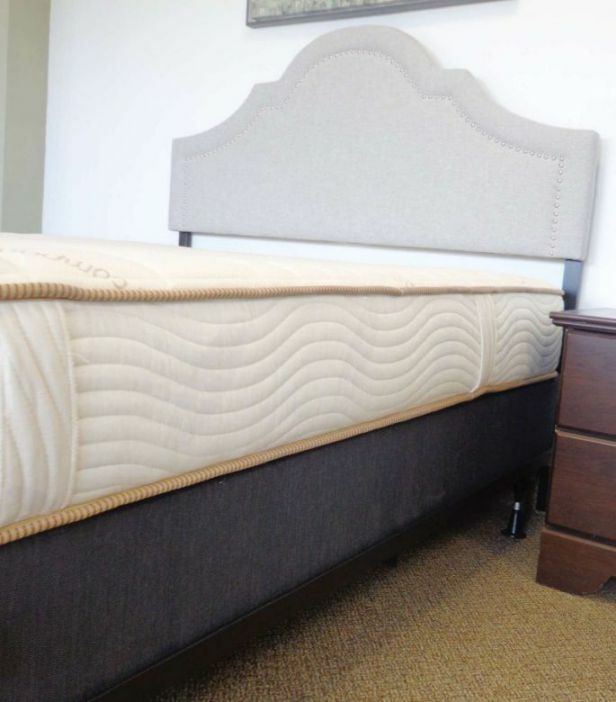 This mattress will have a consistent dense latex core foam as well as five zoned latex comfort layer on each side that is firmer support where you need it. These high-quality latex foams will provide a solid, stable surface from edge to edge. This helps allow full use of the surface for sleeping and will have a good support if you are sitting on the edge of the bed as well. We found little to no difference from sleeping on the edge of this mattress to sleeping in the middle. The quality materials allow for the entire sleeping surface to be utilized and maintain the same feel throughout. We also noticed that when sitting on the edge that this mattress still held its integrity and didn’t give you much feeling of falling or sliding off. This mattress comes in at $1899 for a queen size and that includes 120-night sleep trial and a 20-year warranty. This mattress also has FREE white glove delivery service. This is a HUGE perk, considering the mattress is VERY heavy. It will be hand delivered and set up for you, as well as including the removal of your old mattress and box spring too. We feel that when you combine top of the line materials, with quality construction and amazing natural benefits that help you get a wonderful night sleep that this is a great value. This mattress is almost like having two mattresses in one because it is double sided. Latest Zenhaven Mattress Discounts & Promotions – Found HERE! The Zenhaven mattress is 10″ flippable 100% natural Talalay latex mattress. Because of the fact that it is two-sided the construction of the mattress will be a little different than a single sided mattress. 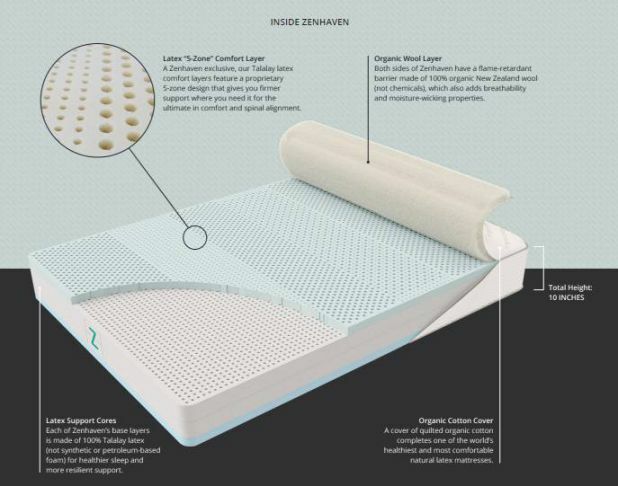 It is almost like a sandwich, each side will have the top layer of 1.5″ (3″ total) of comfort talalay latex. Each side is going to provide a slightly different firmness level to allow for one to be softer while the other is firmer. Both sides will also have 5-zone design that allows for more support in the areas you need it. The center of the mattress will have two layers of 3″ (6″ total) of support latex. These layers are slightly altered in their firmness level to coincide with the top layers to provide the differentiating support needed for the firmer and softer side. Each will ultimately be serving as the main support and core of the mattress. The cover will provide the last 1″ to make up the 10″ total mattress. Each top cover has an organic cotton cover with a layer of Joma wool sewn into the lining. The wool not only adds another layer of comfort but is also naturally moisture wicking to aid in regulating your temperature and is also a natural fire retardant. The materials in this mattress really allow for an amazing mattress from “top to top”. The Zenhaven mattress has a 120-night sleep trial period. This is a few days longer than many other online mattress companies offer. This allows ample time to see if it is the right bed for you. If for some reason you don’t love your new latex mattress or it isn’t quite right, no problem. Zenhaven, and Saatva, in general, offer great customer service. And are ready to work with you to resolve any issues or help you exchange or return and refund your purchase if needed. This mattress also has a 20-year warranty. This is fairly standard for a mattress of this quality. Latex is a long lasting and durable material that will last for years. Allowing Zenhaven to include a substantial warranty that will coincide with the life of the bed. And covering any manufacturer defects or flaws that would allow this mattress to stray from its intended lifespan. Making it even more appealing. If you are looking for more specifics for the Zenhaven 120 night risk free trial period or warranty, find out more at zenhaven.com. Or for a helpful tool check out Our Mattress Warranty & Trial Period Guide. Latest Zenhaven Mattress Coupon – Found HERE! We loved this mattress, but don’t just take our word for it. See how many others love the Zenhaven mattress too. 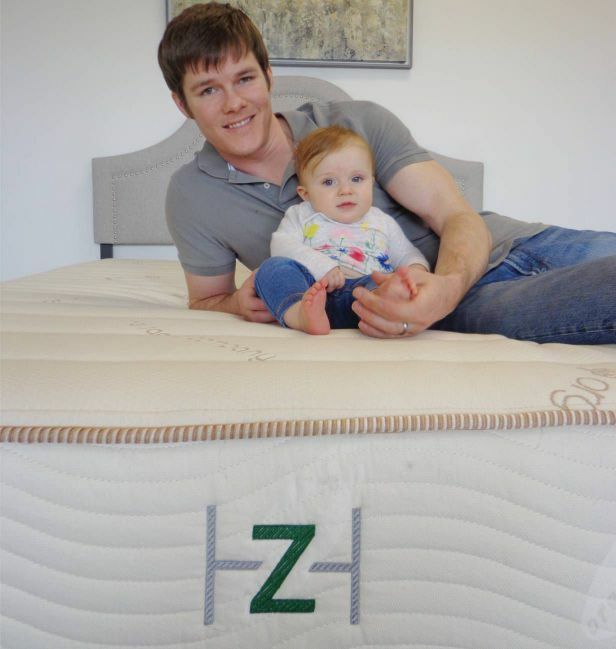 “I ordered the Zenhaven mattress and am thoroughly happy with my purchase. My husband and I love this mattress. It’s so comfortable that I look forward to curling up in bed each night! The order and delivery was very easy. I ordered a second mattress for our guest bedroom.” – Jenise P.
The Zenhaven mattress may be one of the best all latex mattresses on the market. This combination of denser core Talalay latex with the softer and more comfortable top layers make for a truly natural and premium product. This mattress is very zen-like and will create many years of long-lasting support and comfort with this unique style and ample benefits. You want a mattress that allows you to choose your preferred level of firmness and is as easy to change your mind as it is to just flip your mattress over. You want a very high quality, durable 100% Talalay latex foam mattress with ample support and optimal pressure relief that will even be delivered and set-up for you. You like the naturally aeration and cooling properties of latex along with a perfect bounce and added benefits of organic cotton and wool. You would like a mattress that comes from a company with a well known reputation and brand that also has a substantial warranty too. Still looking for some more information? Visit Zenhaven at zenhaven.com. Also, have questions for us? Please contact us and we would be happy to help you!